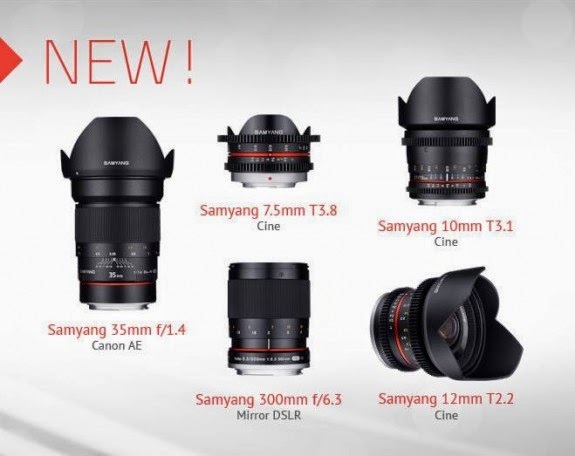 Samyang company announces expansion of its sales portfolio and market release of new photographic and cine lenses. New Samyang 35mm f/1.4 Canon AE, 300mm f/6.3 Mirror DSLR photo lenses and VDSLR series is to be released on April 29th 2014. Samyang 10mm T3.1, 12mm T2.2 and 7.5mm T3.8. Visit Samyang's website to get more information. New products branded with Samyang logotype include an interesting 35mm f/1.4 lens with Canon EF mount, the latest version will feature AE (Auto Exposure) function, which was fitted only in lenses with Nikon F mount before. The newest version of the lens that is marked with AE symbol comes with a microprocessor which can electronically confirm the focus value from the body level. The lens’s construction remained unchanged and still ensures a perfect optical and mechanical quality. Samyang 35mm f/1.4 has been designed to work with Canon digital reflex cameras equipped with full-frame and APS-C sensors.